If you’re writing or researching a news story about transport in Greater Manchester, we can help provide accurate information to meet your deadline. If your enquiry is more general, you may find it useful to find out more about TfGM. If you have an enquiry about transport in Greater Manchester, please call 0161 244 1055. The office is open between 8.30am and 5.30pm, Monday to Friday. Only urgent matters will be responded to outside these times. To speak to the on-duty out of hours officer please call 0161 244 1055 and follow the voicemail instructions (strictly journalists only). Emails are not routinely monitored out of hours. Read some of our latest news or view a directory of all our news releases and news archive. 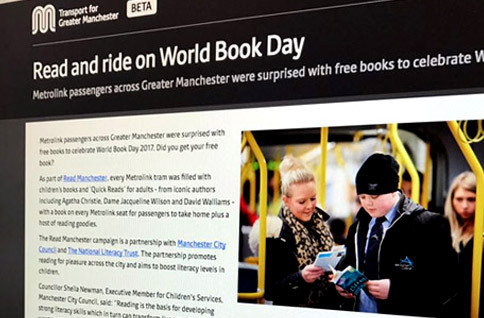 You can also sign up for regular news updates by emailing mediarelations@tfgm.com. For the latest travel updates follow Metrolink and Transport for Greater Manchester on Twitter. You can also find TfGM on YouTube, Instagram and Facebook. If you need photographs of Greater Manchester’s transport network, please email mediarelations@tfgm.com. If you would like to film, take photos or or vox pop customers on TfGM property for a news story, please call us on 0161 244 1055 and request permission first. TfGM property includes Metrolink stops, trams and TfGM bus stations, interchanges and cycle hubs. Please try to give as much notice as possible. Non-urgent or commercial requests to film on TfGM property should be submitted in writing at least two weeks in advance. To submit a filming request or to ask for some advice, please complete a location filming form and someone from the team will be in touch with you. If you want to film on a bus or train service, you’ll need to contact the relevant operating company. To seek filming permissions for Manchester Piccadilly train station, please contact Network Rail. Northern manage Manchester Victoria and most local train stations. TfGM has an extensive range of locations which can be used for TV, film or photography purposes. Find out more about filming and other commercial opportunities. TfGM doesn’t directly provide bus, train or tram services. We own the Metrolink network and work closely with the operator KeolisAmey Metrolink. If you have a question about Metrolink operations, new lines or future plans, please contact us. We also work alongside media teams in a number of transport organisations across the North West. Please consider whether they may be able to help with your enquiry. Most Greater Manchester bus services are run commercially by private operators. The biggest local operators with media teams are Arriva North West, First Manchester and Stagecoach Manchester. Find out which operator runs the service by checking the bus route timetable. You can also see a full list of bus operators. The majority of local train services are run by TransPennine Express and Northern, with some services by Arriva, Virgin Trains and East Midlands Trains. If you’re not sure who runs a service visit www.nationalrail.co.uk. To find out more about work to transform connectivity across the North of England, please contact Transport for the North (TfN.